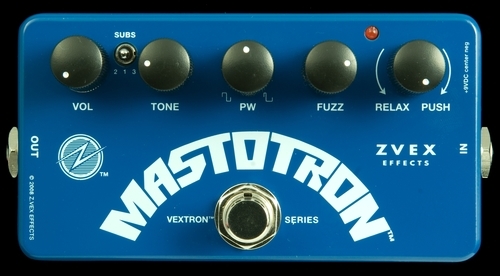 The Mastotron from ZVEX is a sub-heavy silicon fuzz with some new twists: An input impedance control (push/relax) that adjusts from passive pickups to line level. It works very well for re-amping bass tracks that need to be fuzzed up after tracking and keyboards. There’s also a three-position sub control switch, a treble tone control, adjustable pulse width, and a wide fuzz depth control. More flexible than any silicon fuzz to date.